Did we actually think the NHL would rule against itself? NHL commissioner Gary Bettman upheld Jake Voracek's two-game suspension levied by George Parros from the league's Department of Public Safety. Voracek met with Parros and Bettman Tuesday afternoon for about 75 minutes to review the hit on Islanders defenseman Johnny Boychuk, who is currently going through the league's concussion protocol. Boychuk is currently day-to-day. The two sides reviewed the video and discussed the details of the play itself. "I had a good feeling about it, but they're not going to tell you how they feel right away," Voracek said after Wednesday's practice at the Wells Fargo Center. Voracek spoke prior to the league's final ruling. "There's no question that it was interference. I think the explanation on a suspension is that I went out of my way to make head contact with Johnny Boychuk, which I don't think I did. I think I changed my way drastically and my explanation was that I was bracing for contact. I didn't mean anything by it. Obviously, they saw it differently." Interestingly, the on-ice referee Frederick L'Ecuyer told Voracek that he did not make initial contact with Boychuk's head and that's why he wasn't given a game misconduct in addition to his five-minute interference major. However, the officials could only make that determination by looking at the play in real time at actual speed, whereas the league office had the luxury of reviewing the hit frame-by-frame that shows Voracek not only initiated the collision, but also came into contact inadvertently with Boychuk's head. 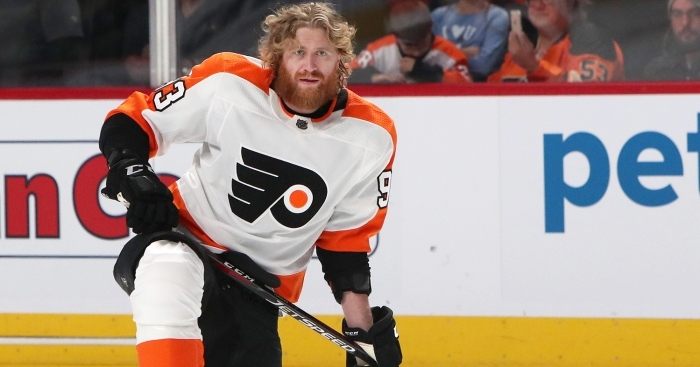 Voracek will serve out the remainder of his suspension when the Flyers host the Washington Capitals on Thursday. It's his first suspension of his 846-game career. But how can you not be looking to the much anticipated rematch between the Flyers and Islanders on March 23 in Philadelphia after Boychuk motioned at Voracek, saying, "I will get you." "He's pointing at me like it's WrestleMania or something. Come on, it's a hockey game. This is a guy who was sucker-punching 19-year-old Nolan Patrick last year at the end of the game, and he's going to do that. Give me a break."